The Schultz Law Firm PC offers this website as a service to the public. As legal advice must be tailored to the specific circumstances of each case, nothing provided herein should be used as a substitute for advice of competent counsel. The materials on this website do not constitute legal advice, do not necessarily reflect the opinions of The Schultz Law Firm PC or any of its attorneys or clients, and are not guaranteed to be correct, complete, or up-to-date. This website is not intended to create, and does not create, an attorney-client relationship between you and The Schultz Law Firm PC and you should not act or rely on any information in this website. Accordingly, please do not send us, via e-mail, any information about any legal matter which may involve you unless or until you have received a written statement from us that we represent you. If you would like to engage The Schultz Law Firm PC to be your law firm, you must call (512) 472-7792, and speak with Stephen Schultz to see if you are able to become a client of The Schultz Law Firm PC. Past performance is not a guarantee of future results. Every matter is different. The Schultz Law Firm PC assumes no liability for the use or interpretation of information contained herein. This publication is provided "AS IS" WITHOUT WARRANTY OF ANY KIND, EITHER EXPRESSED OR IMPLIED, INCLUDING, BUT NOT LIMITED TO, THE IMPLIED WARRANTIES OF MERCHANTABILITY, FITNESS FOR A PARTICULAR PURPOSE, OR NON-INFRINGEMENT. Unless otherwise indicated, attorneys listed on this web site are: not certified by the Texas Board of Legal Specialization. 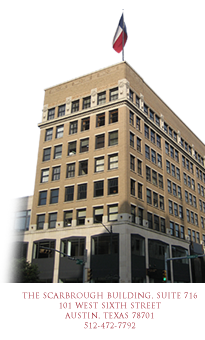 The Schultz Law Firm PC is a Texas Professional Corporation, and its principal office is in the heart of downtown Austin, Texas as the corner of Sixth and Congress in the historic Scarbrough Building.